Online registration will close at 11:59 PM CST February 22, 2019. If a race has NOT sold out, late registration will resume at the Little Rock Marathon Health & Fitness Expo on March 1-2, 2019. On-line registrants will receive an auto-generated confirmation immediately after the registration is submitted. Keep this email confirmation for future reference as it has vital information you may need race weekend. If you do not receive an email please CLICK HERE. A transaction and credit card processing fee will be applied to the total charge by RacesOnline.com. Mail In registration fees are higher than online fees and postmarked by February 22, 2019. Registrations postmarked after February 22, 2019 will be held until the Little Rock Marathon Health & Fitness Expo and processed at Expo rates (if the desired race is not sold out). Please read carefully before registering for any event. It is understood that you have read and confirm (via your submitted registration) your understanding of all event policies. The Little Rock Marathon does not offer refunds for any reason. The Little Rock Marathon does not happen overnight. Expenses must be incurred in advance, which makes it difficult and costly to make changes after registration. Medals, bibs, shirts and other items are ordered many months before the race and purchased according to information provided during initial registration. As a result, and similar to most races in the industry, the Little Rock Marathon does not offer refunds. This applies to individuals with injuries, unexpected business, family emergencies, etc. The Little Rock Marathon reserves the right to reject any registration. 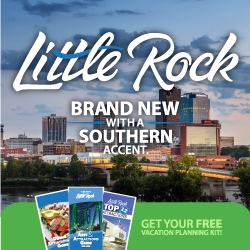 The 2019 Little Rock Marathon (and companion races) are expected to sell out. All participants MUST pick up their race packet during the Health & Fitness Expo to participate in the race. Please see packet pick up page for more information. Registrations may only be transferred to another individual by following the transfer process listed above. Unauthorized transfers will not be allowed. Any individual caught participating with another participant’s number will be removed from the course and disqualified. An official race number is required to participate in all races. NO BANDITS! Please see FAQs for penalties for unauthorized individuals. To correct personal data please CLICK HERE. Participants may switch between races (marathon to half, half to 10K, 5K to half) ONLY if the desired race is NOT sold out. We encourage you to make this decision early as possible as WE CANNOT ADD PARTICIPANTS TO AN EVENT ONCE IT’S CAPACITY HAS BEEN REACHED. Participants cannot give/change their registration to another individual. Please see FAQs for penalties for doing this. There is a transfer program to facilitate this. Changes will NOT be processed until the online Change Form is completed and any applicable fees are paid. Changes requested before 11:59 pm CST February 1, 2019 will not incur an administrative fee. There is a $10 administrative fee added to any applicable race fees. Changes requested after 11:59 CST February 22, 2019 will be processed at race weekend rates (if space is available in the desired race). CLICK HERE to change races. Our goal is to promote a healthy lifestyle and physical fitness. The Little Rock Marathon seeks to ensure the greatest number of properly trained athletes are on the start line. After registering some individuals ultimately decide they are unable to participate for one reason or another. These individuals may opt to transfer their registration to another individual. The Little Rock Marathon does NOT assist in the identification of individuals to receive a transfer. Participants often find transfer partners on our Facebook Page. Deadline February 15, 2019. No transfers will be permitted after this date. Only individuals currently registered for this year’s event may transfer a registration to another individual. When transferring a registration, individuals do not receive a refund on registration fees from the Little Rock Marathon. Any such monetary transactions must be handled directly between individuals. Registrations may not be transferred more than once. Once submitted, the transfer cannot be cancelled. Individuals that transfer their registration and do not follow the transfer process will be disqualified, banned and removed from the course if caught. The unofficial sale or transfer of numbers between participants, whether in person or online, is strictly prohibited for the safety of all participants. The individual currently registered for the 2019 Little Rock Marathon, Half Marathon, 10K, 5K or combo race must initiate a transfer online, giving permission to transfer his/her registration to another individual. An email or phone call will NOTbe accepted to initiate the transfer. The initial registration Transaction Number is required (please see your initial registration confirmation email). CLICK HERE to have another confirmation email sent. No fee is due from the individual transferring his/her registration to another individual. After the online transfer is completed, an email will be sent confirming your request has been received. This email will contain information that should be forwarded to the individual receiving the registration. The individual accepting the registration should obtain the instructional email we sent to the previous registrant, which gives specific information on how to complete the transfer. The individual accepting the registration must also complete the 2019 Transfer Registration online and pay a $30 transfer fee to finalize the transaction. To initiate a transfer, CLICK HERE. Already registered for this year’s race but can’t participate? Take advantage of our new deferral option to roll over your registration to 2020! The deferral window will be open from January 15 – February 15, 2019. A $20 fee will be charged to cover cost already incurred and the administration of this program. Important Note: If you don’t use it, you will lose it. When registration for the 2020 race opens a code will be sent to all deferred registrants. Deferring your entry does not automatically enter you to the 2020 race. Registrants are responsible for registering themselves. Deferred registrations may not be transferred to another person. All deferrals must be requested January 15 – February 15, 2019 and may only be used for the 2020 event. You may only defer an entry once. There will be no deferrals at the race expo. If weather or other conditions present a danger to participants, the Little Rock Marathon maintains the right to cancel or modify the race. Public safety officials and medical authorities will be consulted prior to any race cancellation or modification. Should City of Little Rock officials, which are beyond Little Rock Marathon’s control, impact race official’s ability to conduct the event, the same refund policy will be in effect. Little Rock Marathon asserts that each participant assumes a personal responsibility when entering a running/walking event and accepts the potential risks. The Little Rock Marathon encourages all participants to take all precautions and cooperate with directives given during the race by event personnel. Transfer your registration to another individual (see transfer section above). Defer your registration to another year (see defer section above). Request your participant t-shirt be mailed (if you pick up your race packet at the expo, then we will not mail another shirt). We will be happy to mail your participant t-shirt after the race (approximately 4-6 weeks after the race). T-shirt requests must be submitted PRIOR to race weekend. Please mail a check for $6 (to cover postage) made payable to Little Rock Marathon to 500 W Markham, Suite 108B1, Little Rock, AR 722201. Please include a note that states your name, mailing address, and name of participant.